SMK Dong English Camp: American Summer Camp! I made this very early in the year. I write this title only slightly tongue-in-cheek. Raub is definitely not Paris, but because Raub wants very much to boost its tourism economy, strands of twinkling lights hang in the trees and brighten up the night. I find it very charming; they remind me of Christmas lights year-round! 1. Traffic in Malaysia is much more fluid than traffic in the USA. 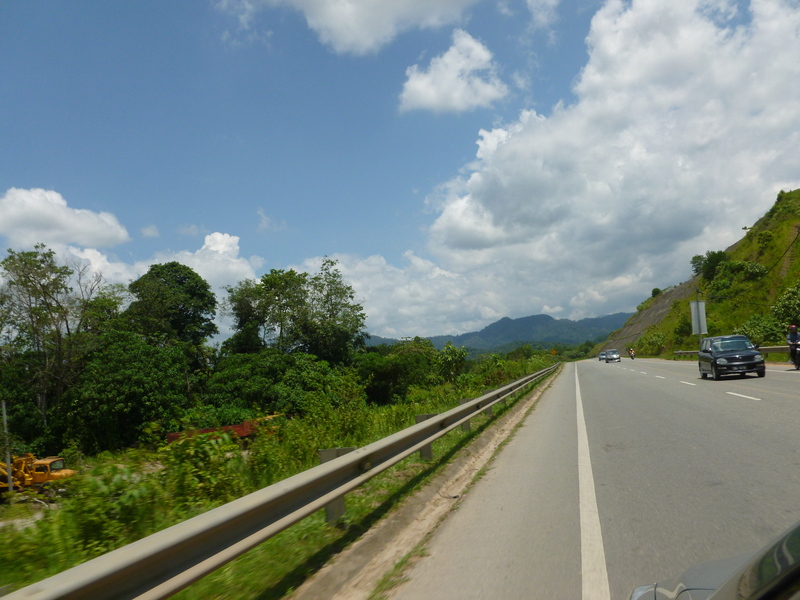 Cars weave and out of lanes, motorcycles drive in an invisible lane located on the edge of the road, and drivers seem to pay more attention to what is going on around them. “Do not pass” markings are amusing and helpful suggestions, but usually ignored. Turn lane? No, that’s a passing lane. Unmarked speed bumps are common (and painful). Goats and cows occasionally wander along the side of the road. Lorries and logging trucks have no regard for human life, especially unfortunate souls on motorbikes. Thankfully, speed limits are in km/hr rather than mph, so the rate that people weave and dodge is at a reasonable speed. 2. In Malaysia, cars are driven on the left side of the road. This was confusing to me at first (which was a problem when coming to a four-way intersection and having a brief moment of terror because OMG I don’t know what lane I should be in), but after several months of living here, I’m used to it. I’m now briefly alarmed when I watch American movies/TV that feature characters driving on the right side of the road. It seems so… unnatural now. 3. Weaving in and out of traffic on a motorbike is really, really fun. Driving in general seems to be less of a chore than an adventure. And I don’t think that’s just because hardly anyone wears seat belts. Well, that might have something to do with it. IF YOU ARE A STUDENT READING THIS: Please, please, please, always wear your motorbike helmet. No excuses. Your brain is too important and accidents on bikes are way too common. It rained soon after this picture was taken. 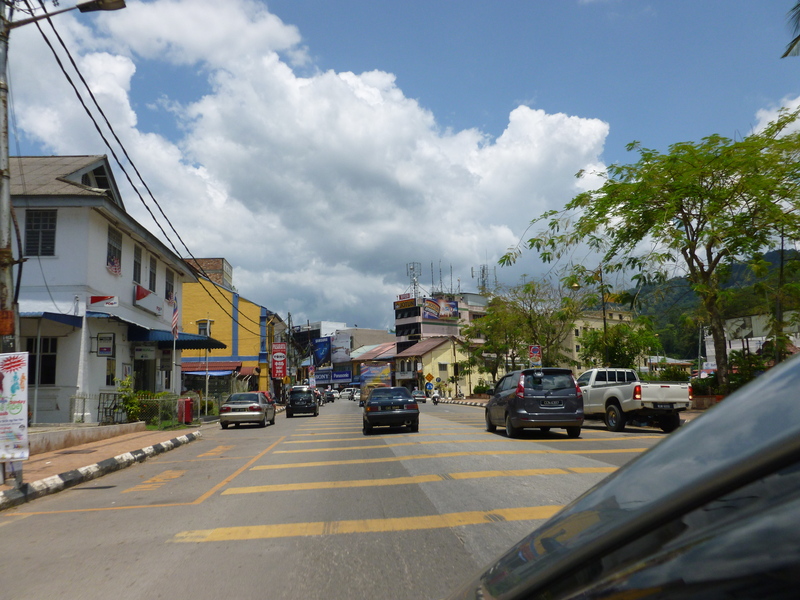 Raub is one of the oldest cities in Pahang. 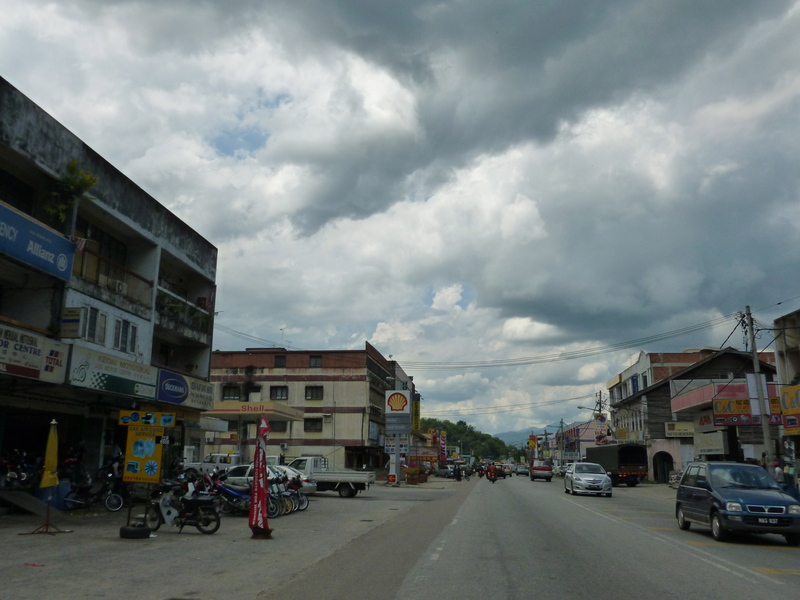 The city is known for its gold mining, and has had an Australian presence in the community since 1889, with the formation of the Raub Australian Gold Mine. A few weeks ago, I accidentally found the gold mine after taking a wrong turn on my motorbike. Locals who haven’t read about ETAs in the newspapers (there are a few!) usually assume I’m Australian. 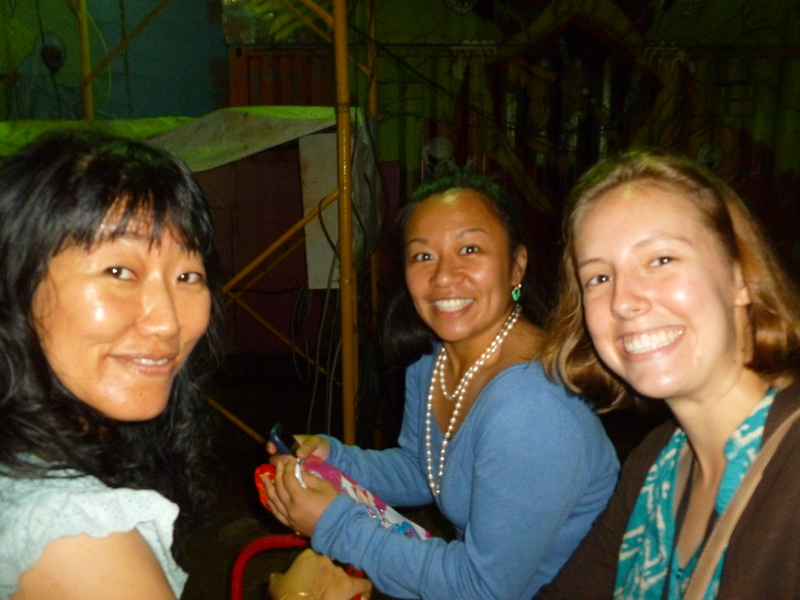 Chin, Jenna, and me at the Fun Fair. We were on a train getting ready to go inside a “haunted house.” It consisted of one person in black jumping out at us and yelling. It wasn’t exactly the experience I was expecting, but it was fun. 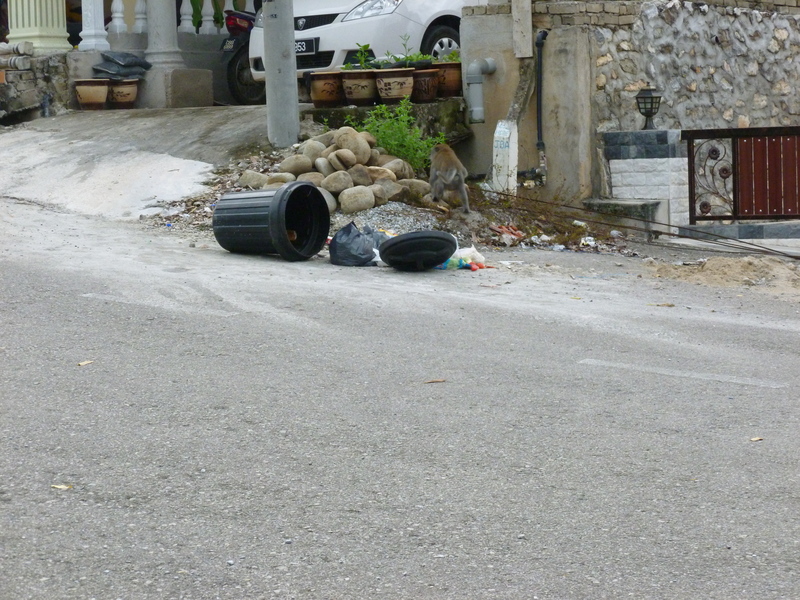 Hey, that’s not a raccoon… AfterI scolded this one, he hooted, crossed the road, and climbed on the roof of my house. Monkey: 1. Nicole: 0. The neighborhood that I live in feels very much like Malaysia’s version of suburbia. 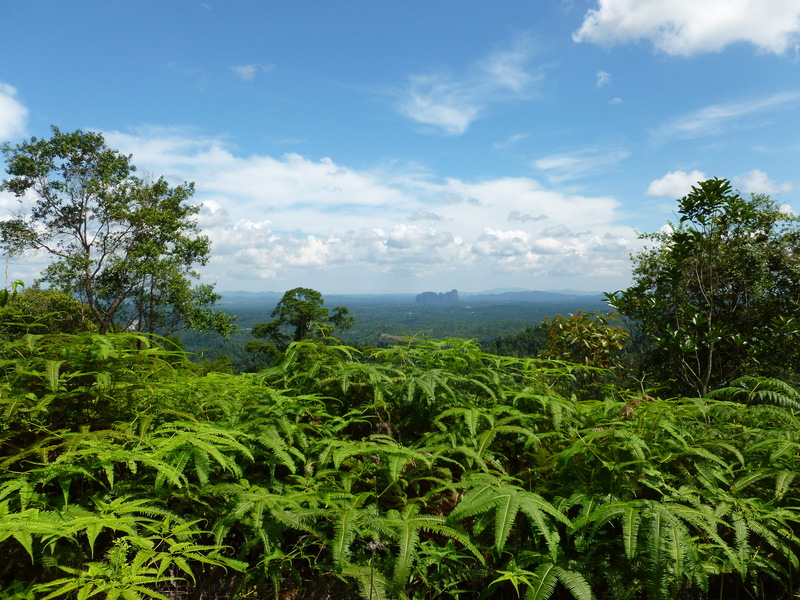 Jungle and plantations surround the area. 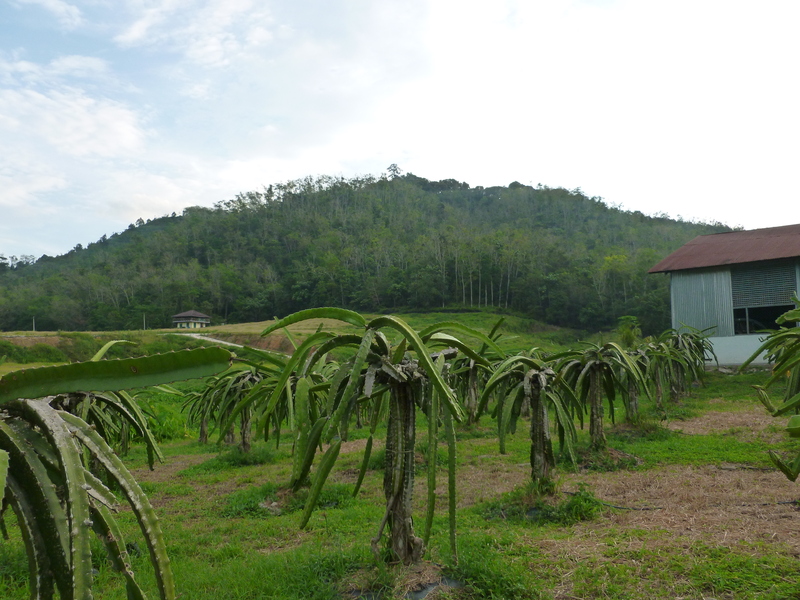 The plantations are for palm oil and rubber trees, and there are some smaller plantations for dragon fruit and durian. Palm oil is a very important industry to Malaysia and brings in a lot of profit to the country, and rubber tapping is a very common profession. Many of my students’ parents are rubber tappers. The ride home from SMK Dong. My school, SMK Dong, is located in Dong, which is about 20 km from where I live in Raub. I still have a lot of Dong to explore, but here’s a clip of the scenery on the way home from school every day. This picture requires no explanation. Next time – more about my school, SMK Dong! 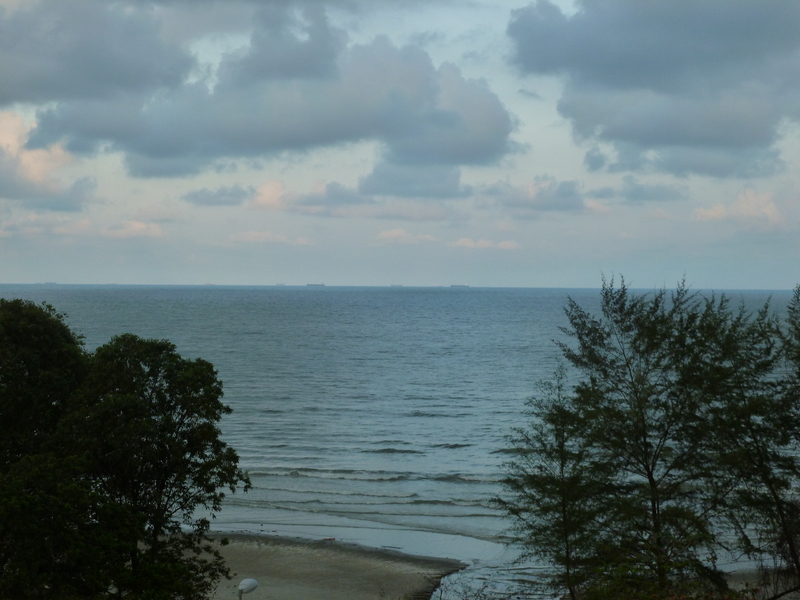 After several hours aboard a bus, we finally reached Cherating, where we would be spending our Chinese New Year holiday before going to Kuantan (the capital of Pahang) for state-level orientation. We took a few moments that evening to explore the beach near our dorms, and climbed the water tower to get a better view. Taking pictures of beaches ranks in the top ten of my favorite things. View from the water tower. The first of many stair-climbing adventures. The amazing (words cannot express the extent) Puan Faridah let the fifteen of us choose what we wanted to do for the long weekend. 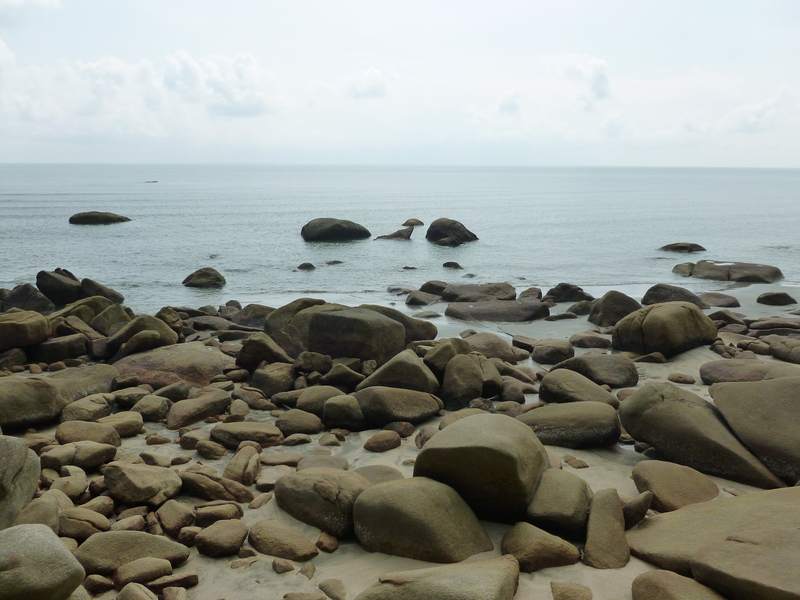 Our first stop was Teluk Chempedak. It was literally impossible to take bad pictures there. We then visited a batik factory. Batik is a style of cloth in Malaysia and Indonesia that is made from stamping wax on a plain cloth and then dipping it in dye (for an American audience: think of a more complicated, more expensive version of tie-dying that uses wax instead of rubber bands). Indonesian batik has tiny, intricate designs, whereas Malaysian batik tends to have bigger loops or regular patterns. I’m still very much a novice at recognizing batik, even though all the teachers at my school wear baju kurungs with batik designs every Thursday. The man stamps a pattern in wax, and then will dip this cloth in red dye. The wax is then peeled off, leaving behind a white pattern. This can be done again and again until the design has many different colors. 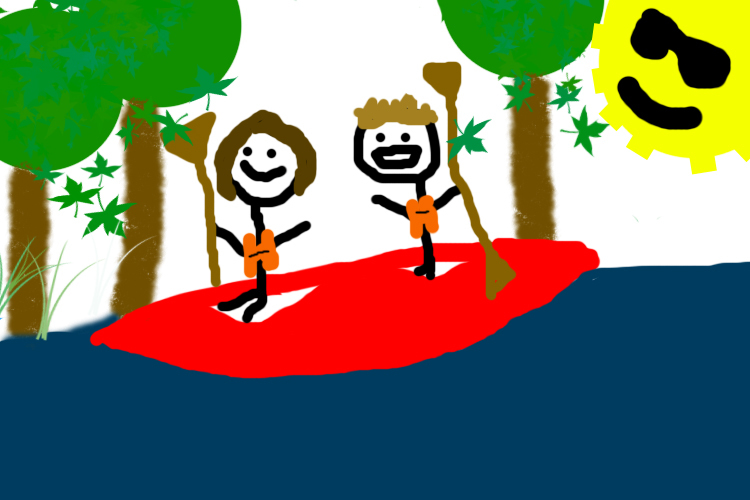 After that, we went to a beach, played in the sand, and then went for a firefly boat ride. The water was unusually high that night, so we saw fewer fireflies than are usually seen. Regardless, fireflies came right up to the boat, so we could capture them gently in our hands, and then let them fly away again. I regret to say that I have no idea where we were; my journaling was sub-par (read: non-existent) during this part of the trip and Googling “fireflies in Kuantan” is not helpful. 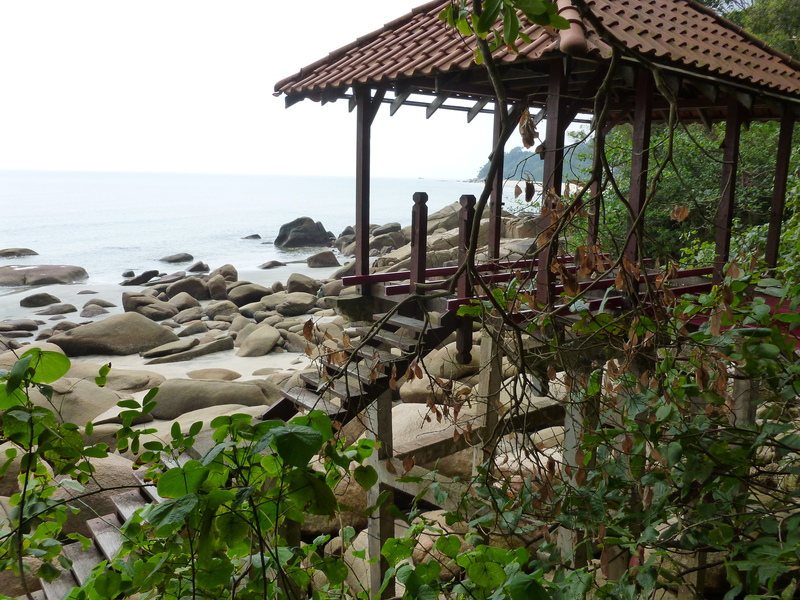 If you are a Pahang ETA reading this and know where we went, please send me an email. Thanks! So peaceful. We were unaware of what would come next. 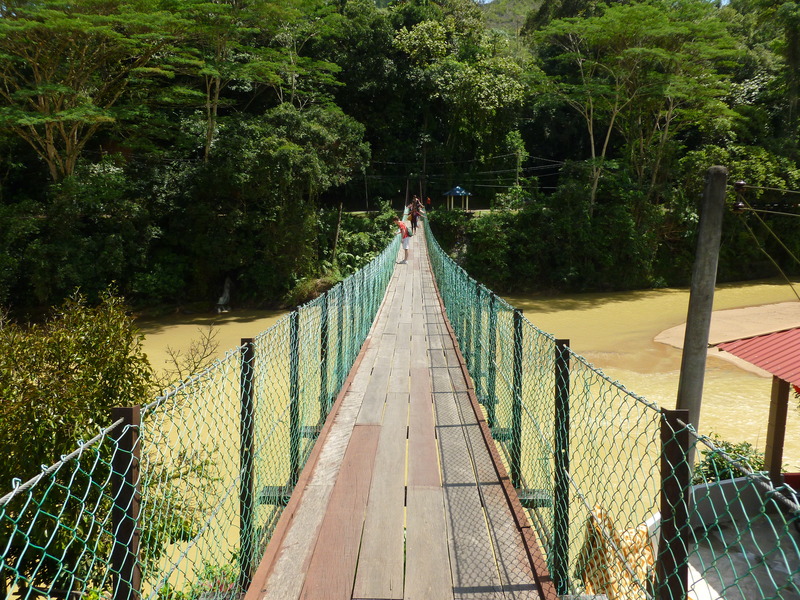 The next morning, we crossed Sungei Lembing (Lembing River) via a rickety rope bridge and then headed to Bukit Panorama. I should have known that something was afoot when Puan Faridah said she’d wait for us on the bus and didn’t follow us up the hill. Bukit Panorama, or “Panoramic Hill,” is 325 meters (1,066 ft) high, not quite a mountain, but by any standards, it is quite a tall hill. Under normal circumstances, it would have been an energetic but doable climb; that day, it was a grossly unpleasant surprise and some of us (myself included) were not dressed for, nor were we emotionally prepared for the trek. After much bellyaching, we finally reached the top and enjoyed the panoramic view. 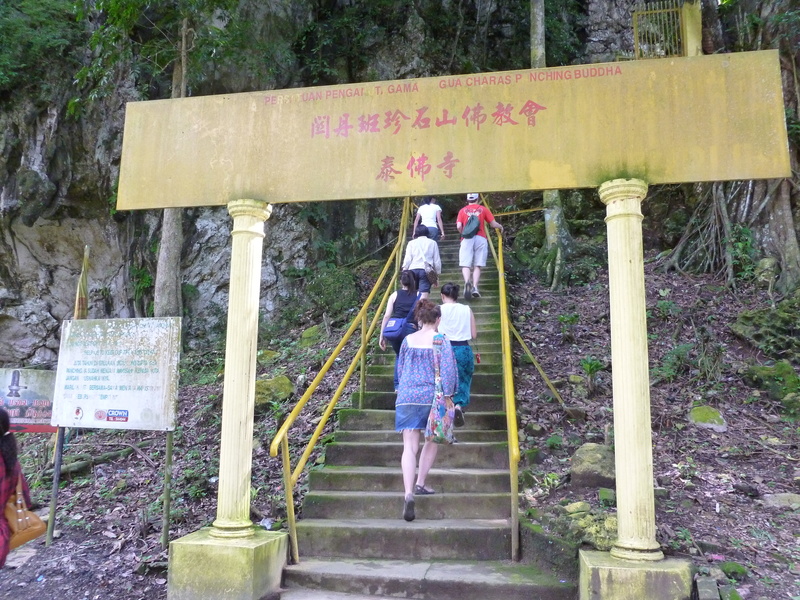 After this day, “I refuse to climb a mountain today,” was a line often heard during our orientation. In all our sweaty glory. 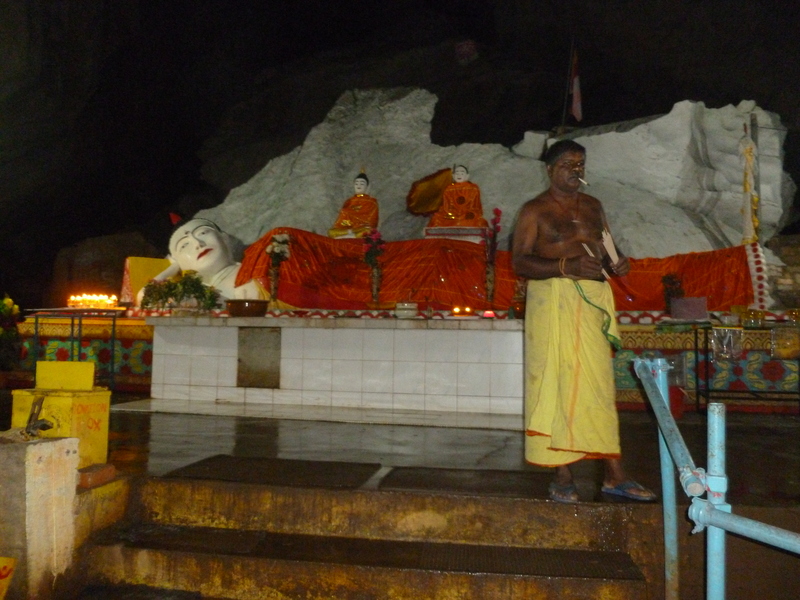 On the way back, we visited Charas Cave, which contained a Sleeping Buddha. 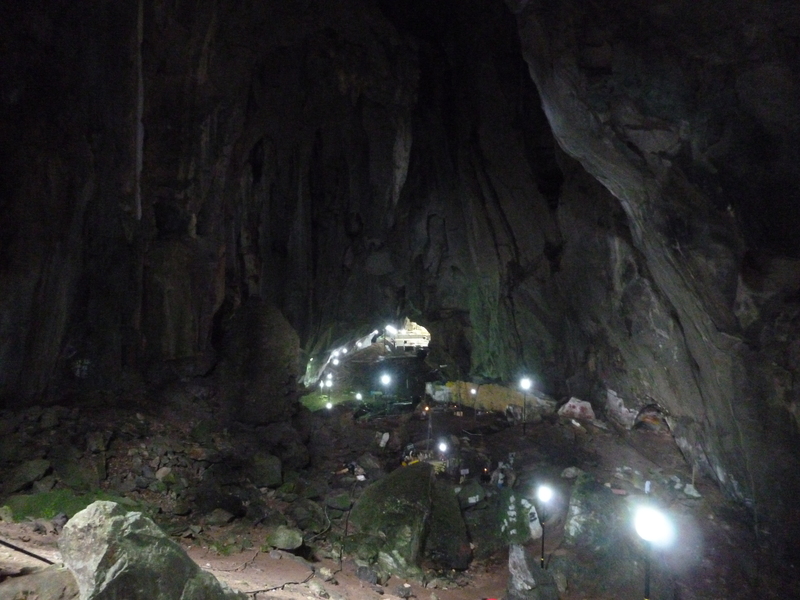 After climbing Bukit Panorama, the last thing I wanted to do was climb more stairs, but walking around in the cave made me feel like Lara Croft, so it was worth it. 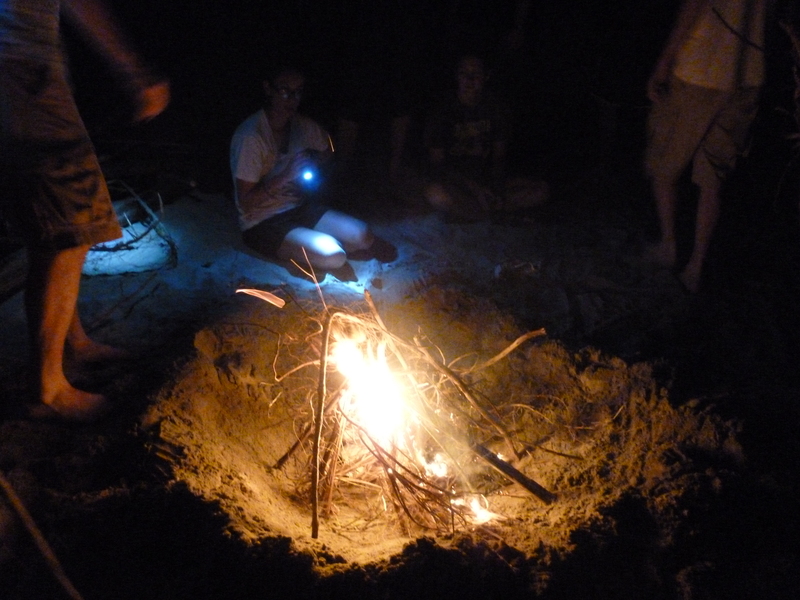 That night, we introduced Puan Faridah & Daughters to the glory of a beachfront campfire. We roasted the only bag of halal marshmallows in all of Kuantan (and about three years beyond its expiration date) over a fire fueled by driftwood. The more scientifically minded among us designed and implemented trenches to avoid rising tides for as long as possible. Ultimately the South China Sea reclaimed our fire, but it was fun while it lasted! The next morning, we visited Tasik Chini (Late Chini). 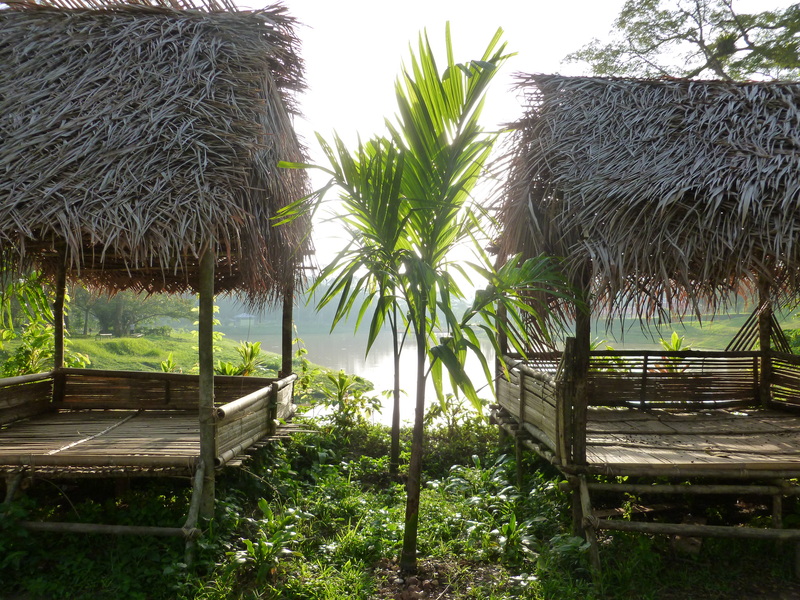 Tasik Chini is known for its Snake Hole and its orang asli population. We took a boat ride to see both. 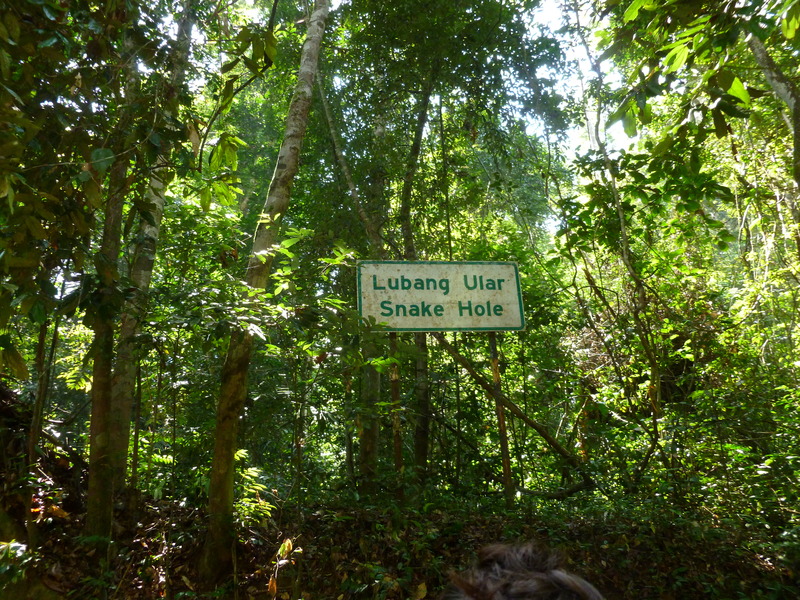 The Snake Hole has various legends associated with it. My favorite is the one in which the dragon-snake of Malaysia went to fight the dragon-snake of Thailand, and after an embarrassing defeat, the Malaysian dragon-snake burrowed in the hole to sulk. Our tour guide told us that this particular dragon hasn’t been seen since the 1960s. It’s like the Loch Ness monster, except uniquely Malaysian. As for the orang asli – for those not familiar with the term, it means “original people,” and refers to indigenous Malaysians. Orang asli are nomadic people who live in the jungle. They generally speak their own languages, and this specific community has children that commute to a government school by boat. The orang asli have a reputation for being tough and self-sustaining; the man in this photograph told a story about fighting and killing a tiger. Friendly locals with excellent English, thanks to the tourism industry. I have many fabulous pictures of Katie. The next morning (have I mentioned how much we did during these few days? 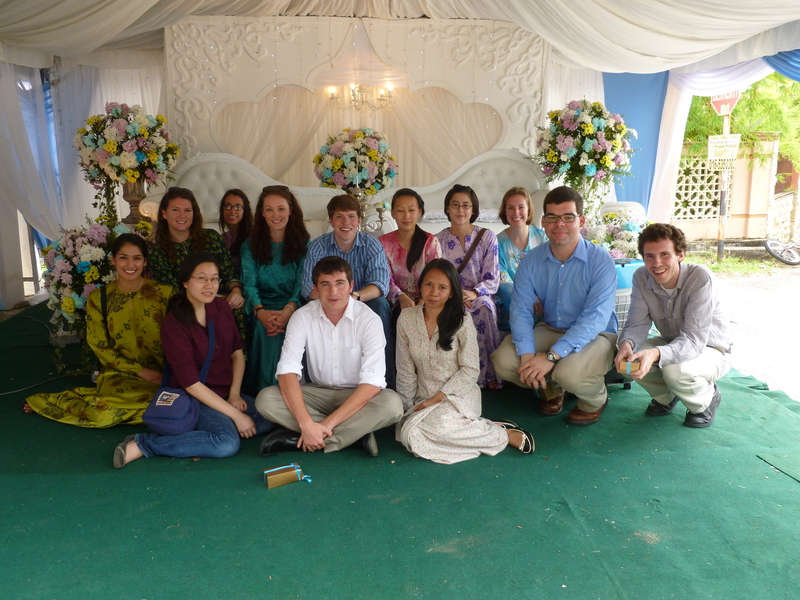 ), we went to a Malay double wedding. A brother and a sister were getting married at the same time, and we were invited to the reception. 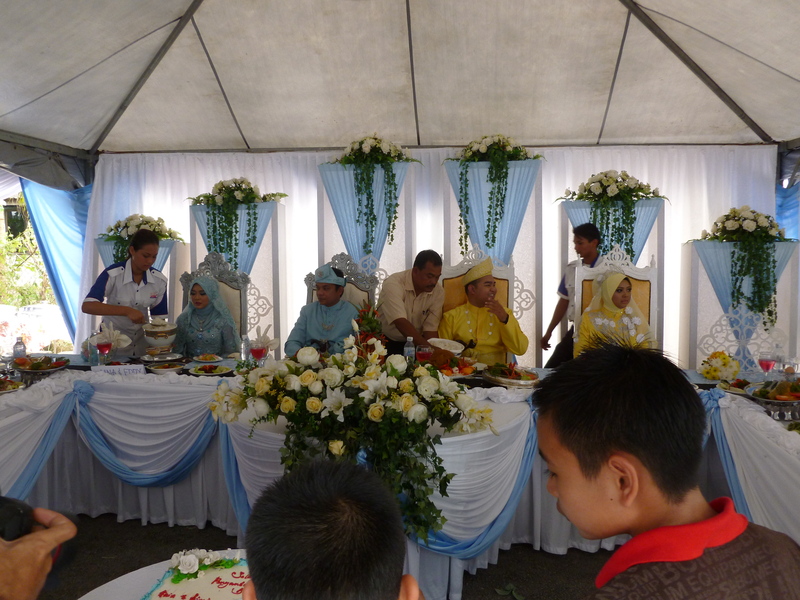 Malay brides can wear whatever color they desire at their weddings; these two chose baby blue and neon yellow. 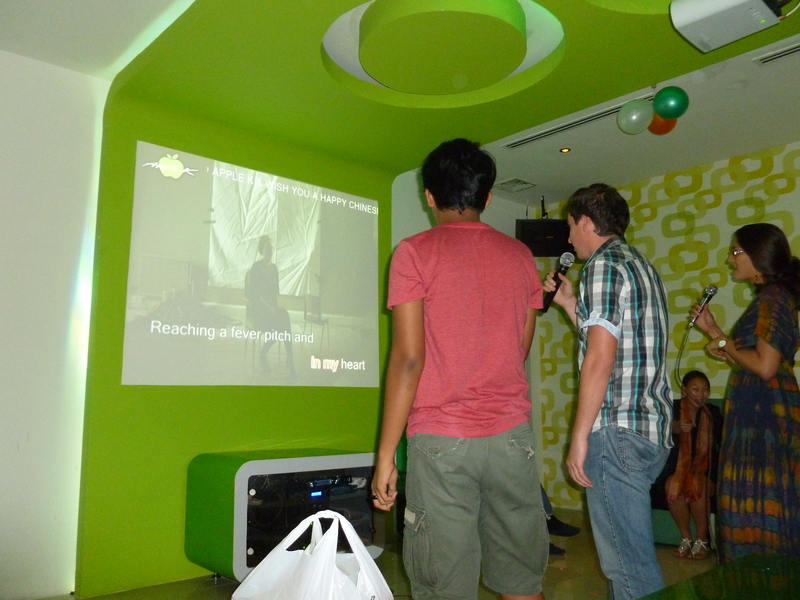 That night, we had a surprise birthday celebration at Pizza Hut (unexpected dinner #2), and finished up the night with karaoke. These few days blur together in my memory, so if you are a Pahang person reading this and I got any of it wrong (possible/likely), please send me an email so I can correct it. We also did several things I didn’t photograph, which are now lost to me. I distinctly remember a dinner at a government official’s house where we all swayed and sang “Lean on Me” without knowing most of the words. Whew! 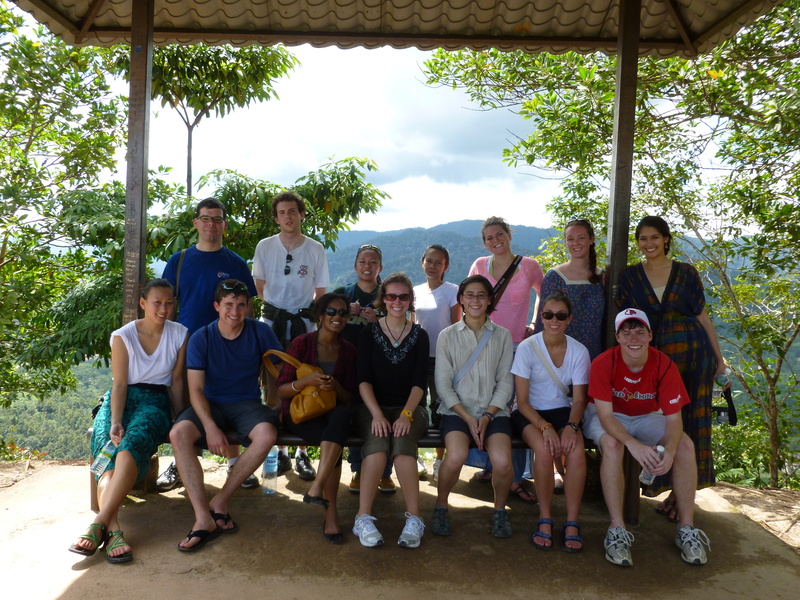 And after this sight-seeing-filled weekend, it was time to get started with Pahang orientation. Lions, the MOE, and the Prime Minister of Malaysia, Oh My! 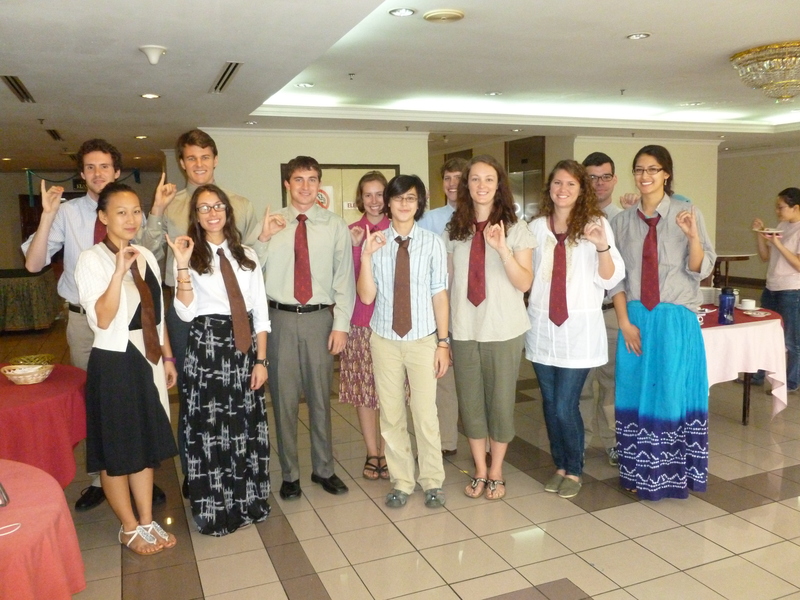 At this point in my story, orientation in Kuala Lumpur was almost over, and on the final day in the MACEE building (18 January), we were treated to a loud and startling surprise. Someone had alerted us that we should grab our cameras for whatever was happening next, so I headed back to the room to get mine. Before I made it out to the hallway, I was greeted by drumming in the distance and what seemed to be the heavy footfalls of an invading army. 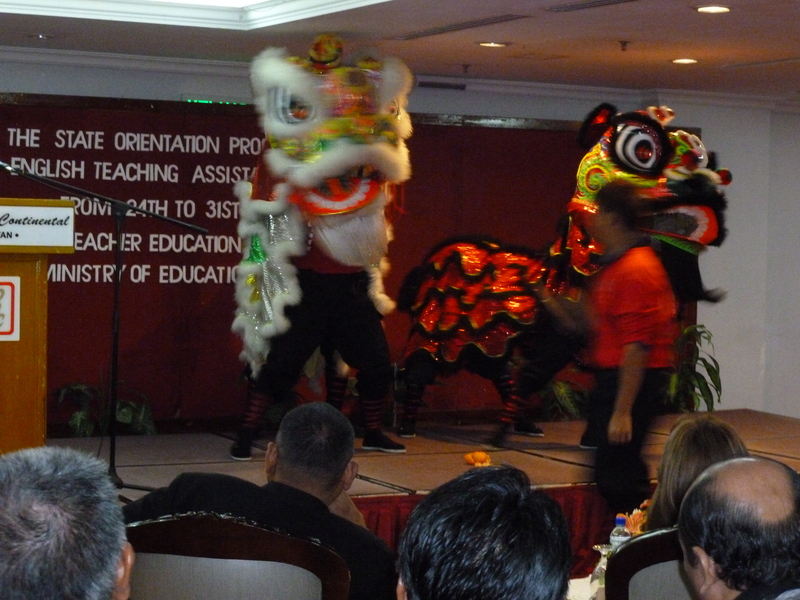 Thankfully, it wasn’t an army, but the first of many Lion Dances we would see and hear over the next few days. A Lion Dance is a staple of the Chinese New Year, in which dancers dress up in traditional outfits, carve fruit, and spit out oranges for good luck. I managed to catch my first orange! 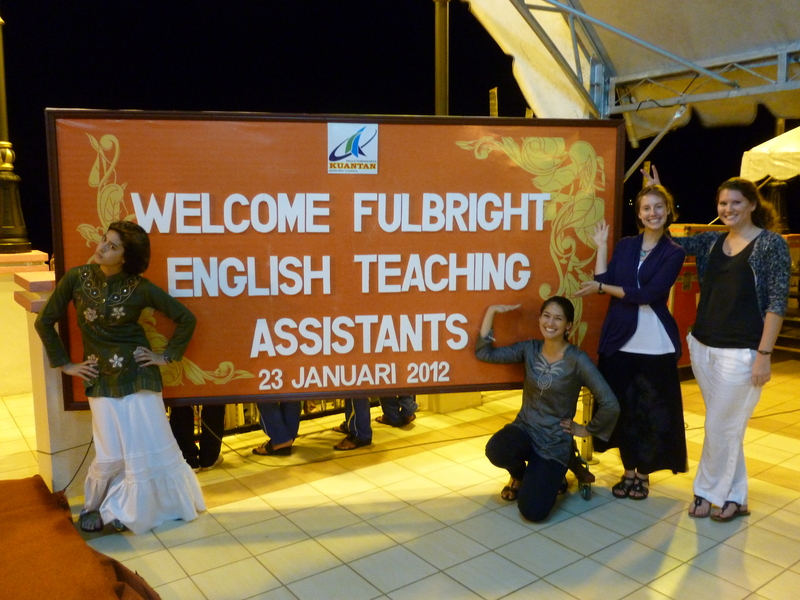 Probably the most interesting thing to happen over those few days (and the thing I was least able to photo-document) was the Fulbright English Teaching Assistants meeting with the Prime Minister of Malaysia. Prime Minister Najib is very interested and supportive of the Fulbright ETA program, and invited all fifty of us to tea in Putrajaya. We were unfortunately unable to bring our own cameras into the event, but there was an official photo taken. I’m in pink, three from the left in the third row. Finally, our last official meeting (19 January) before being dispersed to our states was with the Malaysian Ministry of Education. A slide show was presented, various things were discussed, and Owen delivered his now legendary “Satu Omelet” speech. One of the most famous slogans Malaysia is “Satu Malaysia,” which means “One Malaysia,” and refers to unity among the races in the country. “Satu Omelet” was an American spin on the idea, and Norma later coined a hand gesture to go with the idea (similar to the American Sign Language symbol for the letter “b,” but with a pinky in the air). This gesture has been featured in many group photos of ETAs, and I’m sure it will appear on this blog at a later date. Some people took this meeting more seriously than others. Then, it was time for goodbyes as the three groups boarded different buses to our state-level orientation. 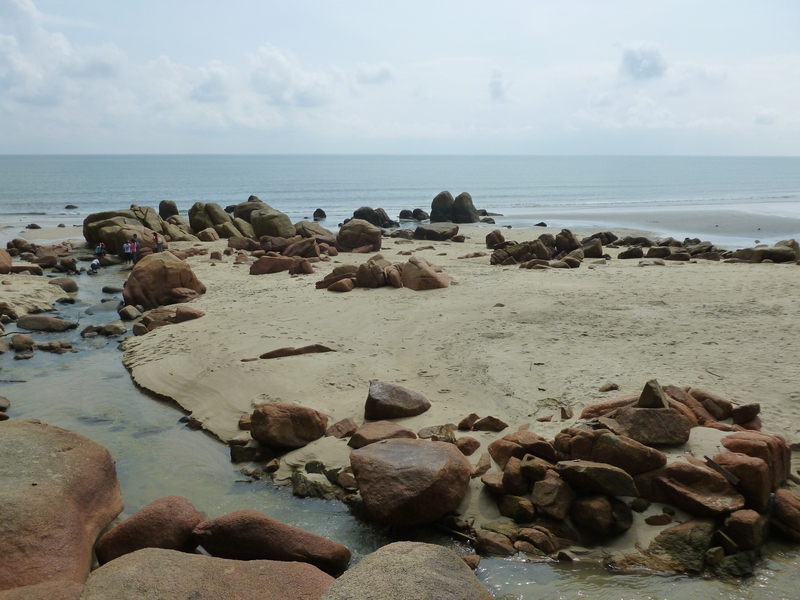 I joined my Pahang comrades, and we headed off to Cherating, a beach town on the east coast of Malaysia. "In the arms of an angel..."
I would like to wish a very happy birthday to my baby brother Ryan who (as of today) is no longer a teenager. Congratulations on being 20 and “a fifth of the way through life.” Please note that I had to scroll through nearly 600 self-portrait photobooth photos of you on my computer to select the perfect photo for this honor. I ultimately chose one that is the perfect combination of things that I love; my brother, my brother being snarky about my love of Sarah McLachlan, and my (extensive) Sarah McLaughlan CD collection. 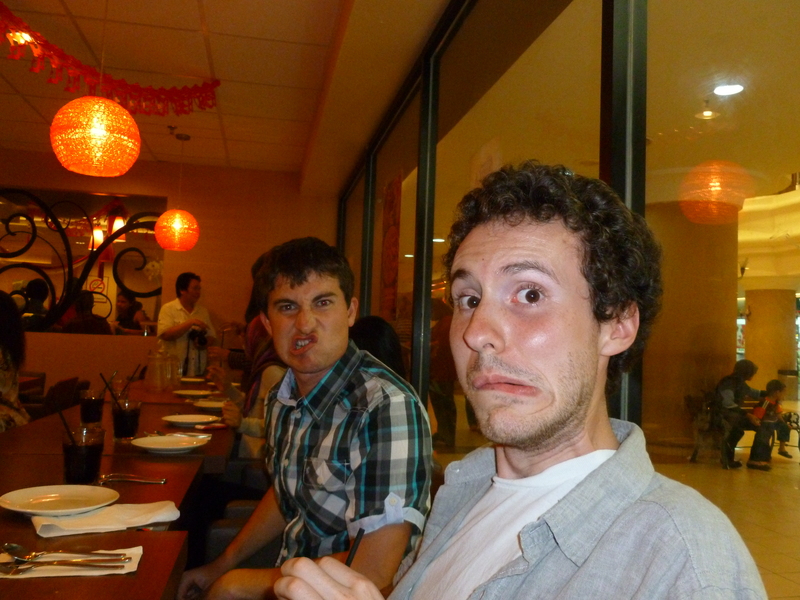 Anyway, Ryan, happy birthday! 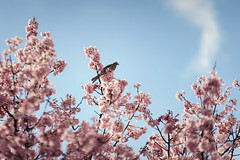 Hope you have a great day. Enjoy your morning run to Denny’s and know that I am craving country fried steak all the way across the world.